Days after Gov. Rick Scott signed a law effectively putting the state’s death penalty back on track, a newly elected Central Florida prosecutor stunned legislators Thursday by announcing she will not pursue death sentences for any capital cases during her time in office. 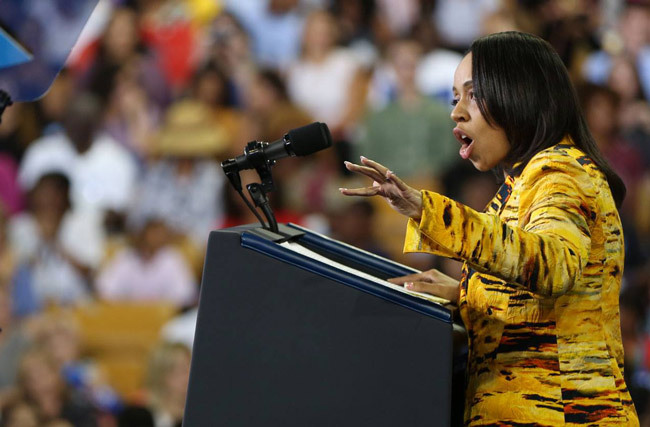 The decision by Aramis Ayala, the state attorney in Orange and Osceola counties, sparked an official rebuke from Scott, who quickly appointed an outspoken supporter of the death penalty as special prosecutor in a high-profile case involving accused cop-killer Markeith Loyd. Scott appointed Brad King, state attorney for the 5th Judicial Circuit, to handle the case of Loyd after Ayala refused to recuse herself. Loyd is accused in the execution-style killing of Orlando Police Lt. Debra Clayton in January. Loyd is also accused of the December shooting death of his pregnant ex-girlfriend, Sade Dixon. Orange County Sheriff’s Deputy Norman Lewis died as a result of a traffic crash during the hunt for Loyd. Ayala “has made it clear that she will not fight for justice,” Scott said in a statement announcing his reassignment of the case to King, who is based in Ocala and has been the circuit’s chief prosecutor for nearly three decades. Ayala’s decision infuriated other state officials, including Attorney General Pam Bondi, drew harsh criticism from law-enforcement organizations and prompted some legislators to call for her ouster. The death penalty has not proven to be a deterrent to crime and the cases drag on for years, adding to victims’ anguish, according to Ayala. “I do understand that this is a controversial issue but what is not controversial is the evidence that led me to this decision,” she said. But Republican state House members from the region held a hurriedly scheduled news conference Thursday morning and attacked Ayala for failing to pursue the death penalty against Loyd. The lawmakers accused the prosecutor of failing to do her job, which they maintain requires her to seek the death penalty in certain instances, including cases in which law-enforcement officers were killed. Rep. Bob Cortes, an Altamonte Springs Republican whose district includes part of Orange County, said he was outraged and called it “a slap in the face” to Loyd’s alleged victims and the law-enforcement community at large. Senate budget chief Jack Latvala, who is mulling a run for governor, went further. “I think she ought to be thrown out of office,” the Clearwater Republican told reporters Thursday. Bondi, whose office represents the state in death-penalty cases before the Florida Supreme Court, also criticized the local prosecutor. Ayala’s decision “sends a dangerous message” to residents and visitors to the Orlando area and “is a blatant neglect of duty and a shameful failure to follow the law as a constitutionally elected officer,” Bondi said in a prepared statement. But Jacksonville criminal-defense lawyer Bill Sheppard, who has represented defendants in capital cases for nearly five decades, disagreed. Ayala’s position is more in line with a growing national trend by courts, along with some governors and legislatures, that takes a harsher view of the death penalty, Sheppard said in a telephone interview Thursday. Even some death-penalty proponents agreed that Ayala enjoys latitude regarding whether to seek death sentences. “I’m a big supporter of local discretion on filing decisions,” Sen. Rob Bradley, a Fleming Island Republican who is a former prosecutor, told The News Service of Florida on Thursday. Florida voters have the ability to vote for state attorneys every four years, Bradley said. The tumult over Ayala came on the same day a House committee overwhelmingly approved a proposed constitutional amendment that would give the Legislature the ability to impeach state attorneys and public defenders, a power now limited to the removal of the governor, the lieutenant governor, Florida Cabinet members and judges. Ayala’s decision “goes beyond prosecutorial discretion and into the realm of dereliction of duty,” said House Judiciary Chairman Chris Sprowls, R-Palm Harbor, a former prosecutor in line to become speaker of the chamber in 2020. Florida’s death penalty has been under a harsh spotlight since the U.S. Supreme Court in January 2016 decided that the state’s capital sentencing system violated the Sixth Amendment right to a trial by jury. Florida lawmakers last year rushed to address the ruling. In part, they made a change to require that at least 10 of 12 jurors recommend death for the sentence to be imposed. But in October, a majority of the Florida Supreme Court struck down that law, finding that it was unconstitutional because it did not require unanimous jury decisions, something required in all other cases. Lawmakers again scurried to address the issue during the first days of the legislative session that began last week, passing a measure requiring unanimous jury recommendations. Scott signed the measure into law on Monday. There is no rational explanation or justification for state-sponsored murder. I realize some egregious acts of murder are so repugnant to society that legalized execution seems fair and just. But it is not. Executing criminals merely lowers our society to the level of the accused. It is also unevenly applied and irreversible. There are other remedies, including life sentences without parole. Yes, that cost burdens society, but that’s the price of an enlightened civilization. I applaud Aramis Ayala’s principled stand. We need more figures like this attorney Ayala! At least you stood up for what was right ,even if the corrupt took you down. Governor Scott should demand her resignation. If this scumbag (Lloyd) doesn’t deserve the death penalty, I don’t know who does. Maybe she would be better suited running an animal shelter. The penalty is ultimately the jury’s and judge’s decision. Why is she proclaiming her stand now? Absolute arrogance. Governor Scott should demand that his staffers to get him a wig. @Knightwatch, I want to hear you say the same words when a member of your family is gunned down in cold blood. What is ironic here is that if the accused had been, say, a white republican who did a similar crime – not only would ar-a-miss charge the death penalty, but she would put in an express lane. just another hypocrite from the loony left. this partisan hack needs to be shyte canned. Lloyd killed 2 mothers, one of which was a cop! It is a total laugh listening to other loony lefties who have such a big problem with the death penalty, but absolutely no problem killing babies??? The death penalty is not and has never been a deterrent, and until the great state of florida can guarantee with 100% certainty that everyone on death row is there legitimately then it has no business executing anyone. Definition of government job – Elected,took an oath, swore to uphold the duties, and then do whatever part you feel like doing. Thank you Gov. Scott for your swift action in removing this left-wing goofball who, unsurprisingly, sides with violent criminals over victims and their families. Obama and Hillary would have praised her decision – thank God those days are over! When you kill a killer ,it shows that killing is ok.
Times have changed. Hopefully, these people will now have very short government careers and their blatant disregard for the law will soon be diminished. What arrogance! Say goodbye to the last eight years! @Dave give me a break. Lets just say your family is killed by some sicko, a young pregnant mother is shot point black, I guess you would clap your hands if the killer spent life in prison all while your family members never had a chance to enjoy life. . Remember your Christian teaching since your bringing that up. God killed a lot of people in the Old testament. Ah the 20 million people Genesis 6.7, killing the first born Exodus 12.29, so God should have forgiven, but per your words God is a killer. . Just for starters. This attorney needs to be replaced in this case. How would executing someone, no matter how horrible the crime, bring back the victim? How about the horror and sorrow that befalls the criminal’s innocent family and friends? The crime is done. So long as the criminal cannot commit another crime, and is removed from society as a punishment, why is this not enough? Why do we have to kill in retribution? Civilized societies do not do this. Ah yes, modern christianity is all about the jesus except when it comes to black people, guns, and executions. Then it’s old testament slavery time or an eye for an eye. Mark, I don’t know about the bible, I follow my heart. My heart tells me killing is wrong. Republicans could make us all happy by moving to a country where their core values are more popular, e.g. China, North Korea, Saudi Arabia, Iraq, Syria, Yemen. Islamic governments, in particular, love the death penalty and public executions. Hey Tricky Ricky and Big Pam – go for it – and take little Donald with you. Knightwatch, all you have to do is google “convicted murderers who killed after release” and you will find the answer as to why we should have the death penalty. You can keep your civilized society; I’d rather keep my family alive. This what George Soros’s money gets you. Nothing but a bunch of progressive liberals who are seeking “social justice,” which is not synonymous with real justice. The right to life supporters should love this woman. Oh wait…it’s right to life until birth. Then it’s support death regardless of cost. These Republicans are something! Now look at who is yanking your leash – follow the money. That’s just a whiff of the gangrene of the soul that is devouring OUR country. What do North Korea and Trump’s Amerikkka have in common? Plenty. Cult of personality led by spoiled brat man child monster who lives for revenge. Check. Spending on military at the expense of all else. Check. Man child monster who never apologizes for anything, but has more to apologize for than almost all the people who ever lived. Check. Right On Pogo! Our local “brain trust” simply is not capable of understanding that even our dictatorial governor cannot throw an “elected” officer out of office. While the rest of our country is making an effort to move out of the cave and out of the old testament, many in Florida should be looking for their “Bam Bam” outfits. Who did an unborn child ever hurt or kill? Now Charlie Manson or Ted Bundy on the other hand…. W.Ryan: Unborn children have done nothing wrong other than to have been unwilling participants in others’ carelessness. Murderers have killed and will likely kill again if given the opportunity. There is a difference, you see.